Without giving away any super spoilers, I will say that this book takes the love triangle of Will-Tessa-Jem to a whole new level. Which I enjoyed, because it didn't pit Will against Jem in terms of good/bad choice or anything like that. If anything, Mrs. Clare presents both of them as equal opponents in the competition for Tessa's heart. We also find out a lot more about their relationship (Will and Jem's) and more about what being a parabatai means. I also greatly enjoyed the character development of Jessamine, Charlotte, and Magnus. Well done, Mrs. Clare! Aside from pacing in certain areas and maybe a bit of over description, I adored Clockwork Prince. Once everyone is able to get their copy of the book, you literally will not be able to put it down. I promise this. 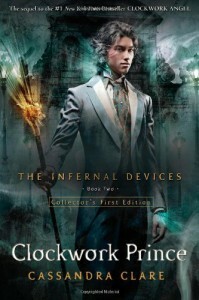 The dialogue is as hilarious but well-written as ever, and if you haven't already, you'll begin to draw parallels between Will in The Infernal Devices and Jace in the Mortal Instruments. Also, I quite enjoyed Tessa's development in Clockwork Prince. I love the direction Mrs. Clare is taking her. She is definitely growing up, I will tell you. Two of her more "intimate" scenes in the book will have you fanning yourself, trust me. All in all, wonderful book. And regardless of all that I have read about Shadowhunters, I STILL want to be one.